Hello! Here I am with another week of quotes. This week’s theme is standing out from the crowd. This does not imply that we all have to dress outrageously or have a wacky opinion on something. 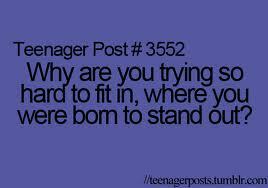 Instead, what it insinuates is being yourself to stand out from the crowd, not hiding who we truly are from people. I believe that being comfortable with yourself and being ‘different’ if that so be the case, is an essential ingredient for a happy life. Check out some of my favorite quotes on the topic and let me know if you agree!